Use ColoRotate directly from Creative Suite 4! Fuse the inspiration of ColoRotate and the power of Creative Suite 4! Seamlessly integrate this innovative color editor into your workflow. Gain more control over your foreground and background colors. Sync palettes between multiple computers. Share palettes with colleagues, collaborators, and clients. Once installed, the extension is conveniently available from the “Window > Extensions” menu. Fully Mac and Windows compatible with Adobe Photoshop CS4 or newer. The ColoRotate 3D color editor plugin for Adobe Photoshop CS4 is intended to give you another way to edit colors  intuitively and effectively. The magic of ColoRotate is that your colors are displayed and edited in three dimensions, the same way your brain naturally understands colors. Learn more about color and the brain to understand the innovation of ColoRotate. Screenshots of the plugin showing the 3D color, Sliders, Details and Browse modes. 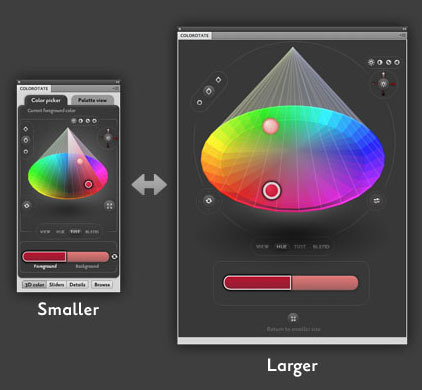 ColoRotate’s 3D diamond-shaped color picker is based on the HLS Color Model. See more information about Color Models. ColoRotate is bursting with functions not available in the built-in Photoshop color tools. 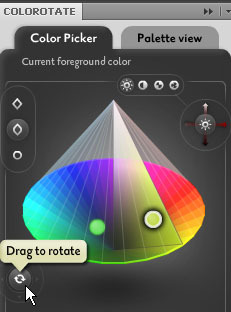 Using the 3D color picker, you can easily choose your colors by tilting and spinning the diamond-shape. Rotate button: With the rotate button, you can swivel the 3D color picker in any direction you wish by dragging the button and moving it around the circle. You can easily access it on the center left of the plugin interface. It’s convenient and easy to select a color simply by rotating the cone-shaped diamond. Rotate button used for rotating and tilting the 3D cone. At the top left, three buttons adjust the tilt to preset positions. Use the preset tilts to position the 3D diamond upright (good for editing tint), slightly tilted (gives you a view of both tint and hue), and fully tilted (so you see only the hue circle, similar to a color wheel). Enlarge Button: Using the Enlarge Button, you can more precisely choose your colors. Especially helpful for people with visual impairment, the Enlarge Button is located at the center left. As shown below, clicking on it generates a pop-up window with a larger 3D cone. Clicking the Enlarge Button will maximize the view for more precision in choosing colors. Editing modes: There are four main editing modes: a 3D view, a precision slider, details for annotating your palettes, and a browse mode to review palettes you have saved. Choose a display mode via the four buttons on the bottom. “3D color” displays the 3D diamond; “Sliders” gives you multiple slider options; “Details” sets details of palettes (it’s not relevant in color picker mode); and “Browse” accesses palettes stored on your computer or in the ColoRotate Cloud.